Sudan is signalling that despite reservations it will comply with a UN resolution ordering it to crack down on Arab militias in its Darfur region. Foreign Minister Dr Mustapha Osman Ismail said the Council of Ministers would meet on Sunday to decide whether to accept or reject the resolution. Sudan's Information Minister said after Friday's UN Security Council vote that his government rejected it. But two Sudanese envoys have since said Khartoum will comply. Dr Ismail told reporters Sudan was unhappy about the UN resolution, which calls on Khartoum to take action against Arab militias in Darfur within 30 days. He also said the resolution lacked balance and sent the wrong signal to rebel groups. Up to 50,000 people have died and more than a million have fled their homes since the conflict began in early 2003. 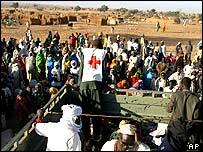 The Janjaweed, the main Arab militia group allied with the government, has been blamed for mass rapes, killings and burning of villages in Darfur. The US-drafted resolution demands that Sudan to make good on promises it made on 3 July to rein in the fighters. It calls for UN Secretary General Kofi Annan to issue a report in 30 days on the progress made in each of those areas. The resolution was only adopted after the US dropped the word "sanctions" and added economic and diplomatic "measures". Sudan's UN ambassador Elfatih Erwa, and its ambassador to the African Union, Osman al-Said, separately said Khartoum would comply. "We are not happy with the resolution, but we are going to implement it - we have no other option," Mr al-Said told reporters in the Ethiopian capital Addis Ababa. US Secretary of State Colin Powell said during a visit to the Middle East: "They [The Sudan government] can say whatever they wish to say. The Security Council has spoken (and) in a rather strong vote." "It is estimated that 50,000 people have died"